Last week, JetBlue had a one-day sale on flights so I took advantage of the discounted flights from Boston to Tampa ($89/each way). I randomly chose Tampa from a list of possible destinations not only because I thought Florida sounded good right about now (anywhere sounds good), but also because Tampa is the home to Busch Gardens and I’ve been on this rollercoaster kick as of late. Wednesday night I arrive at a jam packed Logan Airport. I was astounded by the amount of people flying in and out at 7pm on Wednesday. 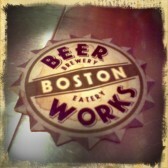 I hung around and grabbed some food at Boston Beer Works inside Logan. I had this young, southern, blonde woman sitting next to me talking yelling to the guy sitting next to her about how she started drinking on her first flight and about how she was about to board her third flight to Nantucket within the hour. “Ya’ll don’t even know how much I’ve been drinking today…” as she just about slides off of her bar stool. I had enough of her yapping after about 20 seconds, but I waited in line to get a seat at the bar so I wasn’t about to let this woman deprive me of food and drink. Now that I think of it, I wonder if she ever made that flight to Nantucket? I’d be surprised if they even let her board the plane. Two and a half hours later I landed in Tampa. I switched my phone on to find eight new text messages from my CouchSurfing host Ginny (what is CouchSurfing?). I immediately thought, oh boy… here we go! It’s midnight and I might just open up these texts to find out that I have no place to stay tonight. Looks like I’ll be sleeping at the airport! That was until I actually read the messages. Ginny and Ray had been out on the town hopping from one hot spot to another in search of some of Tampa’s best live music and were texting me letting me know where they were in case I was to land and take a taxi to meet them. They ended up picking me up at the airport so everything worked out perfectly in the end. On the way home Ray told me all about Tampa Bay, and about how some of the Tampa Bay Rays players would be at this Irish Pub called The Dubliner tonight for last call. Before I knew it, we were parked out front of the Dubliner in SoHo and entering a small, yet fairly cool little Irish Pub surrounded by lots of intoxicated people my age. Not my favorite environment, but it actually turned out alright because the music was good and it drowned out the drunken slurs of the idiots to the right of me. Daniel B. Marshall, the guy who had actually sang the National Anthem earlier in the evening at the Ray’s Game was in the building and was performing til’ close. Daniel came on seemingly half in the bag but still managed to put together a pretty decent set which started off with an alternative version of none other than… the National Anthem! He covered some oldies like S.O.S., and a few other more modern tunes that can be heard on the radio now a days. There were rumors that Evan Longoria (not Eva, EVAN) and a few other Ray’s players were hanging just a few feet from us but I don’t watch baseball so I wouldn’t know what they look like anyways. Just before 2AM we headed back to my temporary home for the next few days and on the way I witnessed my first ever police chase. Great first impression Tampa! Nothing like a nice welcome to Tampa by watching a guy pass you at a hundred on the highway with the state police tailing him with their lights on. There were no signs of him slowing down, we watched him swerve across and take an exit only to blow right through a red light and head down a side street with his headlights turned off. You know, like the officer hadn’t already grabbed his license plate or anything. And yes, we witnessed all of this while we were cruising down I-275. We get off two exits later and what do you know… the same guy blows through the red light crossing the intersection right in front of us. It’s one of those times where you just get finished talking about something crazy that just happened minutes before and all of a sudden you say… “wait, was that the same guy we just saw trying to evade the police?” Yep, it sure was! By the time we finally reached home I was exhausted. I took a quick tour of the house before collapsing in my big old comfy bed here in Ginny’s house. It’s always a great feeling when you show up at a persons home to CouchSurf thinking that you’ll be sleeping on their living room couch only to find out you’ve got your own private bedroom with a queen sized bed and private bathroom. It simply can’t get any better than this! Tomorrow I’m heading out early to get my roller coaster fix over at Busch Gardens Tampa. Supposedly it’s only 2 or 3 exits away from where I’m staying right now, so I’m really looking forward to trying to get there as soon as the park opens. I’d love to be able to avoid waiting in two hour lines behind whiny little kids. WAHHHH!